Cook bacon, drain and set aside to cool. Chop blue cheese stuffed olives crosswise, into rounds. Slice apple into 1/2-inch by 1/2-inch pieces. Chop bacon. 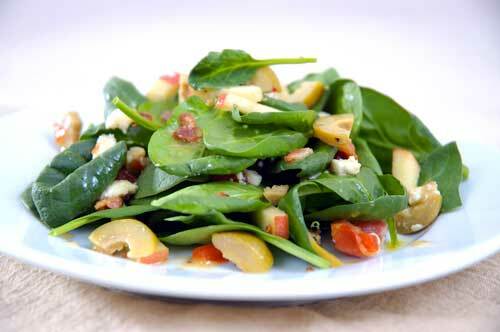 Combine all ingredients with spinach. Combine all dressing ingredients and whisk until combined, and drizzle over salad. Serve immediately.